^^^ Graph of ride. 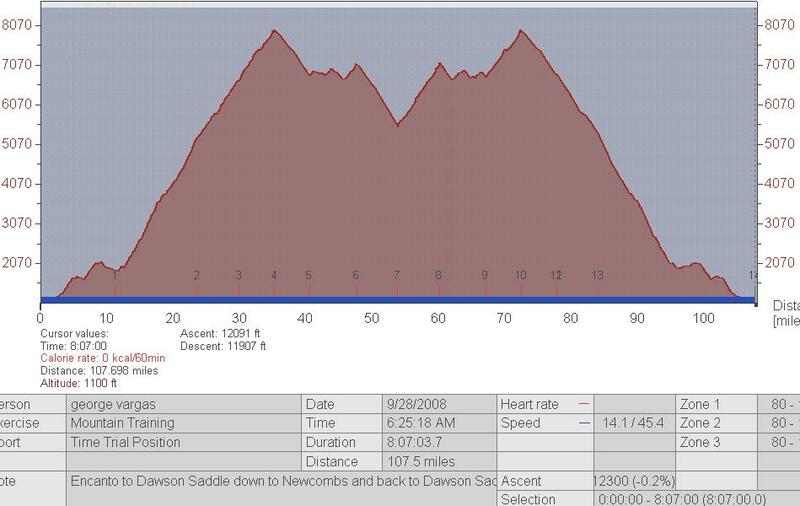 Notice the first climb 35 miles with some rollers. 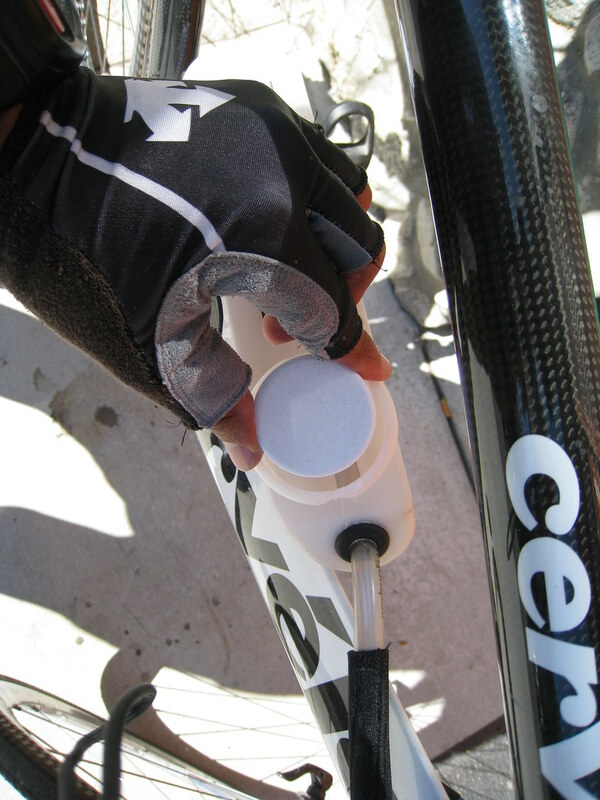 ^^^ How convenient that Motor Tabs tablets fits into my Speefil hydration system. ^^^ Another summit along the way. It is great to have the opportunity to climb from Sea Level to 7000 feet and eventually almost 8,000 feet! well before Furnace Creek 508 that is. I’d like to take this opportunity to thank a few sponsors that keep me rolling. I fueled with Sportquest CarboPro and Motortabs. I rode a Speedfil and a hydration pack from Nathan Sports. I did a 107 mile training ride in the San Gabriel Mountains. 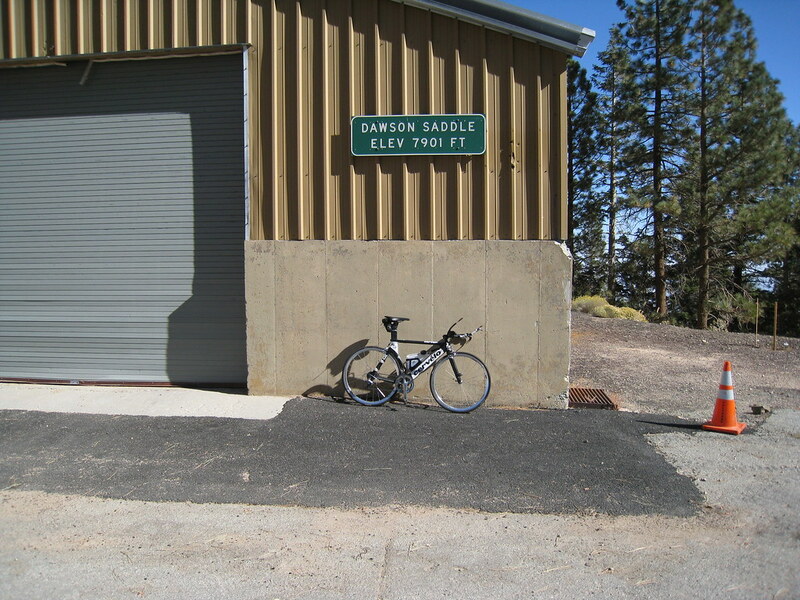 I left Encanto Park (below 1000 feet) in Duarte and rode up Hwy 39 to the Angeles Crest Hwy junction and then continued East another 5.3 miles to Dawson Saddle elevation 7901 feet. It was a 35 mile climb with over 7,000 feet of gain. I then headed West on the AC Hwy and got water from Newcombs Ranch. I climbed back to Dawson Saddle a second time via Cloudburst Summit at 7018 elevation. It was a great day of climbing with VERY little traffic. Mostly because the lion’s share of the climbing is done on closed roads. It was a solo ride. 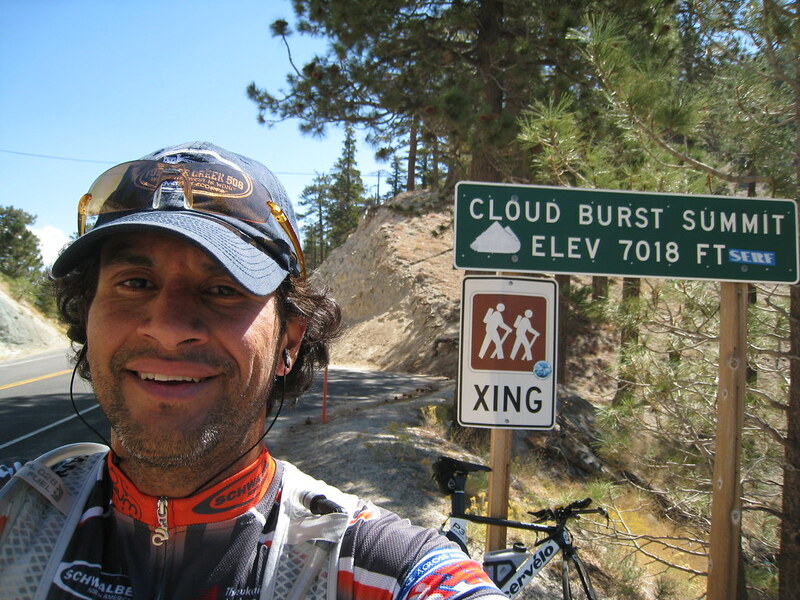 I only saw one cyclist all day near Cloudburst Summit. He was coming East up the AC Hwy. This was a tough ride but since it was cooler at elevation I felt good most of the day. I dreaded the descent into the blast furnace. Sure it was a 107 miles with 12,300 but 11,700 feet came within the first 72 miles all of it on a Cervelo P3 which people say “you can’t climb on a tri-bike”. I say they just need to practice and use proper technique. I usually do the first 200 miles of the Furnace Creek 508 on a Cervelo P3 and that has 12,000 feet of climbing. The main drawback I saw with doing this ride on a TT bike was that on the descent there are a few sketchy sections where the road is in varied states of disrepair. The section from 5,000 feet, up and past the Ghost town of Crystal Lake, to connection of Angeles Crest Hwy has lots of rocks and potholes. The climbing up to 5,000 feet was fairly clear. The climbing on Angeles Crest Hwy was fairly clear as well. You need lots of flat repair options because the roads are closed to vehicles and there is no cell service. SUBSCRIBE TO MY BLOG AND STAY UP TO DATE!! This entry was posted in climbing, Cycling, Dawson Saddle, Furnace Creek 508, Mountains, Training by REV Cycling Directeur Sportif. Bookmark the permalink.